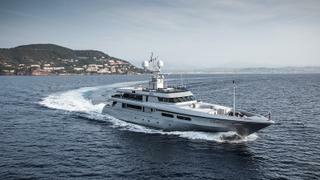 The 51 metre motor yacht Regina d’Italia has been listed for sale by Tomaso Polli at Edmiston & Company. Built in steel and aluminium by Italian yard Codecasa to Lloyds class, Regina d’Italia was delivered in 2006 and has always been privately used with a constant programme of upgrades. Lazzarini & Pickering designed a minimalist interior accommodating 12 guests in five cabins comprising a full beam master suite, two doubles and two twins, all with entertainment centres and en suite bathroom facilities. A further six cabins sleep 11 crewmembers aboard this yacht for sale. The aft deck is ideal for al fresco entertaining and dining with two large sitting areas around two coffee tables while in the saloon there is a central sofa, two low cocktail tables, six armchairs, a large television screen and a cabinet in the centre. The dining room has storage dressers for crockery and cutlery to the side and a forward dining table with twelve chairs. More outdoor living is available up on the sundeck, with a built-in seating area, a Jacuzzi tub and a wet bar with a sink, fridge and ice maker. Powered by twin 2,447hp Caterpillar diesel engines, she cruises comfortably at 15 knots topping out at 17.5 knots with a range of 4,000 nautical miles at 14 knots. On display at the Monaco Yacht Show, Regina d’Italia is asking €18,000,000 with VAT paid.